The silent protest from the One Voice group saw activists line up in front of spectators at the popular theme park, during a dolphin show. They held banners reading “Pour Femke (For Femke)”. Femke is one of the park’s dolphins. Aged 34, she has become a symbol of the fight against marine animal - and specifically dolphin - captivity. Femke was kept in an animal park in Holland for 25 years, before being transferred to Parc Astérix. Videos claim to show her to be in a bad way, in part due - activists say - to the small amount of water “that is unsuitable for her species’ biological needs”, and her calf Ekinox being taken away after being sold to another dolphinarium in Greece two years ago. Protestors have since asked for Femke to be transferred to a marine life sanctuary. In its defence, Parc Astérix has said that Femke is not depressed, but suffering from an illness named Cushing Syndrome, a rare disease linked to an excess of hormones. In a statement, the park said that the dolphin was receiving “a personalised treatment plan”, created by “five European vets who specialise in marine mammals” and delivered by “a team of 10 experienced carers”. 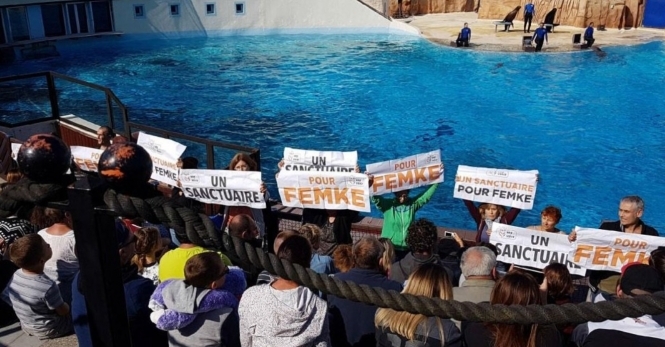 The new One Voice protest comes less than two months after the same organisation held a protest in front of the Hauts-de-France prefecture buildings, to try to influence the authorities on the issue of dolphin captivity. Similarly, since May 12, a One Voice petition launched in partnership with welfare group La Fondation Brigitte Bardot, and cetacean protection network Réseaux-Cétacés, has amassed 107,000 signatures against the practice.